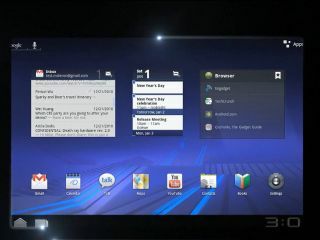 LG has announced its first Android 3.0-powered tablet – the oddly-monikered G-Slate. The new tablet was launched at CES in conjunction with T-Mobile, which gets the headline branding, but beyond a release date set for 'in the coming months' there wasn't much more information about the new device. However, it will be able to run Google Maps in 3D, so hardware-based graphical acceleration is lurking somewhere inside, and a front facing camera is included too. A few demo videos were put together for the event, so even if we're pretty low on actual specs (although that looks a lot like a 10-inch screen to us) there's a whole host of cool demos outlining how Google Talk and Google's new eBook store will work on the tablet. We're still hoping for another announcement from LG regarding a tablet – but it looks like that could be pushed back to Mobile World Congress as we wait to see what's next in the exploding tablet wars.